Premium shoes are distinguished by their overall quality. They offer increased wearing comfort, encourage the capability of their wearer, and, thanks to the first-rate materials from which they are made, ensure longer durability. From sketches in the design stage through to the final touches in the shoe room, there can be many production stages involved in making a shoe. We have created a comprehensible overview of the individual steps involved in the classic nesting manufacturing process. From elegant and simple to elaborately decorated, from wide and comfortable to sleek and narrow. Classic types of men’s shoes such as the Oxford and Derby hearken back to a relatively small number of 19th century prototypes. O ver the course of their centuries-old history, shoes have become objects of true cultural value. Here, in 80 articles divided into 12 chapters, we provide a look into the fascinating world of Goodyear-welted shoes, accompanied by myriad pictures and illustrations. The production method used determines the overall character of a shoe. For example, business shoes should be Goodyear-welted. If you love decorative details, reach for a pair of brogues. A single shoe in our collection can consist of up to 65 individual parts. Shoe construction has hardly changed since the 19th century. A large number of premium materials are involved, resulting in a premium product. A high-quality shoe’s complexity lies in its details. The stuff that dreamy shoes are made of. The basis of a premium shoe is leather, or processed animal hide. Only a handful of varieties are used for shoemaking. Leather’s beneficial qualities result from expert tanning. Proper shoe care involves more than just regularly cleaning your shoes; you also need to put your shoes on and take them off correctly, incorporate breaks from wear, and use shoe trees for storage. Your reward: shiny, durable shoes. 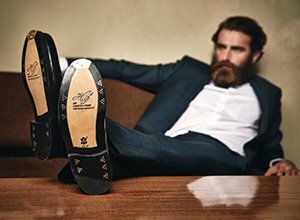 Acquiring a new pair of premium shoes is enough to put a gentleman in high spirits. However, he does not become a true connoisseur until he learns to wear them properly. A perfectly paired outfit speaks to the good taste of the man wearing it. Selecting your proper shoe size and width ensures a perfect shoe fit. Perfectly fitting shoes let you move about comfortably and effortlessly. Moreover, properly fitting shoes support your locomotive system and keep your feet healthy, and thereby elevate your quality of life. T here is much more to shoes than meets the eye. In today’s throwaway society, the fascinating traditional handicraft of shoe production is fading ever further into oblivion. SHOEPASSION.com has carefully assembled knowledge of premium leather shoes, and is dedicated to putting a spotlight on these one-of-kind pieces. Feet bear the brunt of everyday wear and tear. Even so, they are often handled with neglect. Perfectly functioning feet are typically taken for granted. Meanwhile, the threat of lasting damage is constantly lurking. Improper footwear puts your feet at risk. 40,000 years ago, man had already developed the need to protect his feet from the elements. It took several centuries for the tasteful shoes of today to emerge from early footwear prototypes. Glaze, piping, or Lyra perforation, we are proud to present our comprehensive compendium of footwear terminology.